My bike is ready to follow the sun and head toward the office. Our two cars are not enough. This past summer both kids got their driver’s license. My daughter is now driving to college as she commutes from home and my son is a senior in High School – hello, of course he needs a car. So what to do for Mom and Dad? Mom has the longer commute on the freeway and needs a car, so a new car for Mom. Dad has a commute of four miles through town to work. So what to do for Dad (me)? An additional car … good hiking shoes …. or his dream, a new bike? Yep, a new commuter Bike. A Trek Soho to be precise; the Honda Accord of bikes (solid, reliable and still fun to drive). My love to ride has never left and I am committed to riding daily even as the days get shorter and the cold, wet weather arrives. I have commuted by bike since late August and so far so good. The ride is easy-going to work with a bias downhill and the ride home is more of a workout with a shower waiting at home. 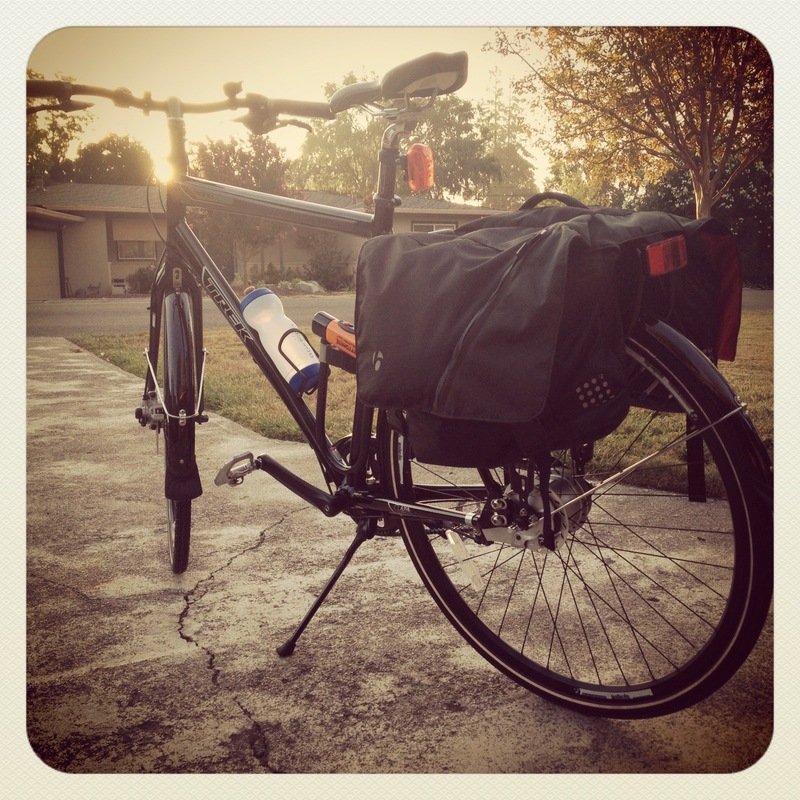 Bike commuting is a great way to slow down and think while I get some exercise. Already I have some observations and see the bike as a vehicle to teach us some lessons on leadership. Life is not a race. You have seen them. The bike racers with fancy bikes wearing bright and tight clothing. They ride with speed and focus as apparently there is a race underway. I let them pass as I enjoy my ride. Of course there are times to push hard and even race in our lives. There are more times though when we should slow down and enjoy the journey. I am a dedicated “unracer”. This term coined by Grant Petersen in his book, Just Ride, points to those folks who just love to ride a bike and understand that not every ride is a race. Vision is more important than you think. A good bicyclist needs to have good vision ahead, behind and to the side. A sixth-sense of when something is creeping up behind you and when that car door will open in front of you. A leader needs this level of vision as well. New bicyclists learn to look in the direction they want to turn and travel. Your bike will follow your eyes. As leaders we should remember this lesson and keep our vision on where we want to go. Our body and spirit will follow our eyes when we fix them firmly on our goal ahead. 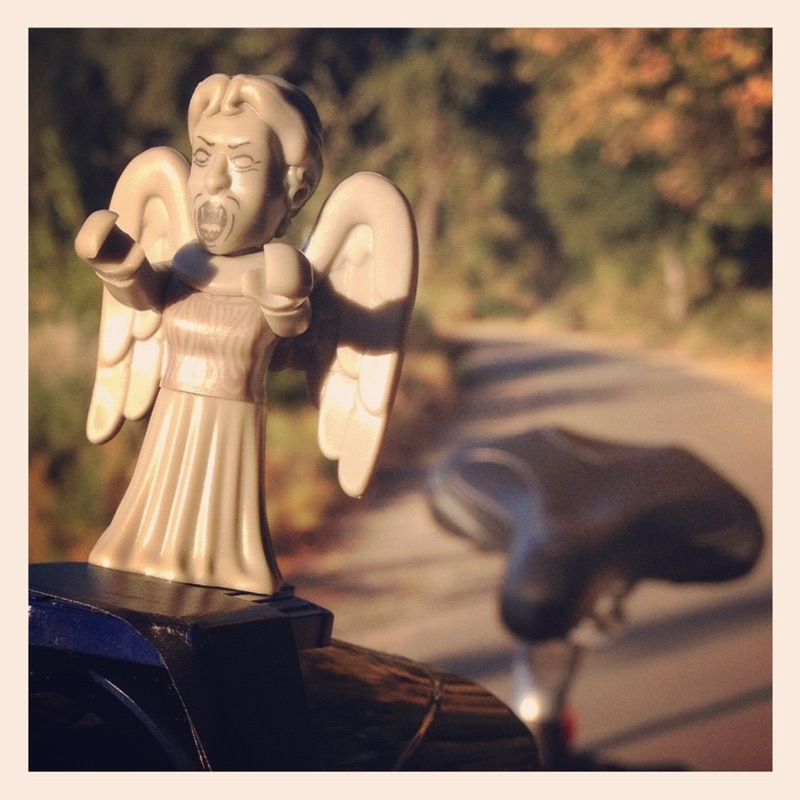 My Guardian Angel protecting me for my ride. I am fine as long as I do not blink. A shout-out to Doctor Who fans everywhere. A routine is good, but shake it up occasionally. For years when I commuted by car I took the same route each day. I was confident this approach was the fastest and most efficient way to work. Now by bike I search out new routes to work. I know which one is the fastest, but others allow new experiences and reasons to explore. As a leader we need to watch out for when we are set into a routine. Is there a different way that may give more insight to our work life and operations? Get on your bike at work and try a new route occasionally. If nothing else you may discover that your original path is best. Now you know. Energy Persists. My energy level at work after bike commuting is higher and sustainable. By using energy I gain energy. Leading involves movement and tapping into this energy level. Attitude is king. “There is no bad weather, only bad equipment”. I read this somewhere and loved it. We can prepare for anything from a cold and wet bike commute to the difficult weather patterns at work. Stay positive as a leader and carry on. Finally, watch out for squirrels while riding to work. I am just saying. LIKE your post Michael…and love your ride. Thanks David. I am enjoying it more each day. I think the absolute best thing annyoe can do, and it’s the absolute easiest thing in the world, is to join in with any BIRD squawking out against salmon and red light runners. Those two behaviors make up the vast majority of complaints against the party. There should be a roar of booooooos for the red light runners. Everyone in a car or standing at such an intersection should KNOW where SJBP stands regarding that behavior. Those first at a red light can also move to cork the path of potential red light runners. That’s another very easy thing to do. Own the intersection!And the comments to the salmon should be as loud and fundamental as possible, also coming from the WHOLE group and not just a few BIRDs. Our power is the size of the group. The vast, vast majority of the group wants to ride the way we ride . Salmon riders don’t read here, don’t help with anything, and certainly don’t have the balls to post here. They’re party crashers. They disrespect everything this group stands for, and their behavior destroys community. They deserve sticks in their spokes, in my opinion. There’s NO excuse for it. Thanks Michael. My energy comment was a last minute add in, but it is as important as the other points. I was a business trainer for 10 years and I relate to your comment on energy in the training session. At times I think I could see it moving around the room and it was my job to keep that energy flowing. Good memories. Happy Cycling works for me. All the best to you. Rob, some advice from a bilcyce commuter advocate and currently injured cycle commuter get back on the bike. When people see you regularly, they become accustomed to you and make it safer for you and other’s. First get a safety vest and wear it when riding.Second lights! BRIGHT lights make sure they work and use them. As is the law for driving cars, have them on 1/2 hour before sunset and after sunrise. You become much more noticeable in those situations. Any time lighting is poor have the lights on.Third drive your bike like a car. Notice I didn’t say ride your bike I mean DRIVE your bike. You ARE a vehicle on the road and if you expect to be treated as one, then you must act like one. Take the lane! Not just 1 from the curb but 3 FEET minimum from the curb or parked vehicle. This is the law and in my experience is the safest way to ride. Vehicles approaching you from behind see you easier and must THINK about passing you safely. They can’t just squeeze by you. Vehicles coming towards you, also see you better as you’re not hiding among parked vehicles or road side signs. They see you as another vehicle.Sure this sounds hazardous, but in the time since I adopted this riding method, the close calls and scary situations have become further and further apart. Yes, it’s good to find quieter streets, but there are times when you can’t do that. That’s when you MUST become a vehicle and demand your right to be there.Ride safe and I wish I wasn’t injured so I could still be on the roads too.